Black japanned metal case with rubber rimmed eyepiece at back and open slot at front where a black drum houses the clockwork automatic averaging attachment. The left half of the sextant carries the bubble and its collimating system, which together form the artificial horizon, while the right half carries the sextant proper: the mirrors and filters and angle scales. Lamps are provided for night observations. 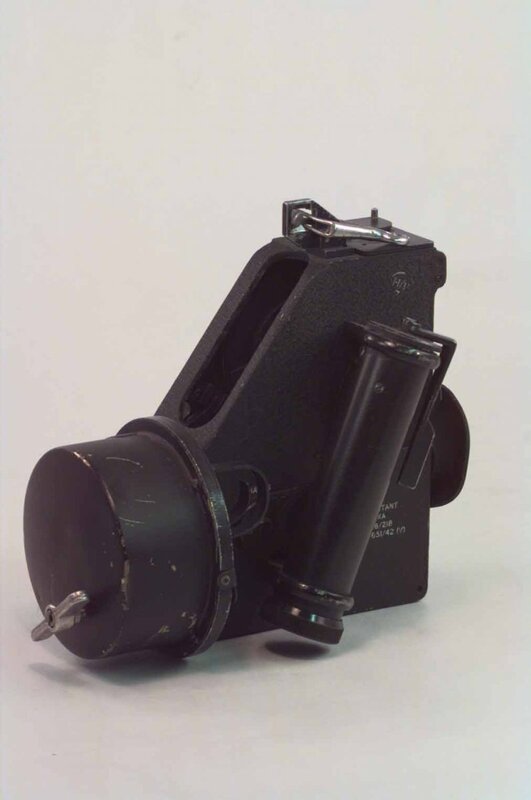 A normal sextant is unsuitable for use in an aircraft because the horizon is not level with the observer as in a ship, so the bubble sextant was developed for aeronautical use in the 1920s. It was very important in WWII. See also 2,59, 100, 322.